Three osprey chicks have found a new home. 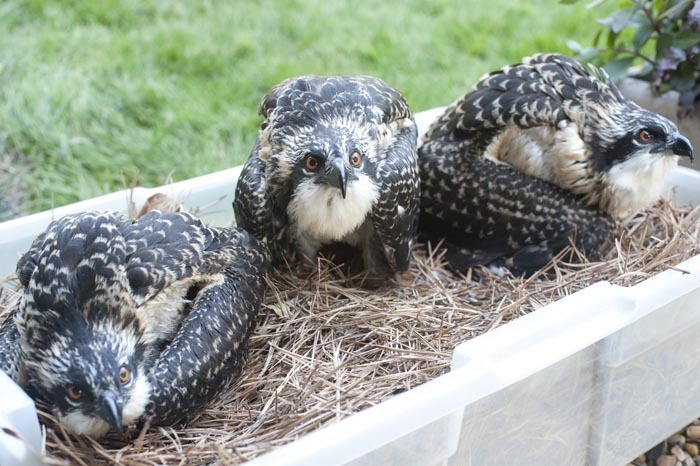 Three baby osprey chicks are being hand raised by Gus Ben David in Edgartown following an accident aloft over Chappaquiddick last Thursday. The birds, which are about two weeks old, fell from their nest when the electrical pole that held them and their nest caught fire. Suddenly homeless, the three little birds were rescued by NStar crews and turned over to Mr. Ben David, a noted naturalist and owner of the World of Reptiles and Bird Park off the Edgartown-Vineyard Haven Road. Mr. Ben David said the three osprey are in good shape and have already learned and grown a good deal in just a few days. He plans to fledge the animals back to the wild in a few weeks. Osprey are one of the most celebrated avian creatures on the Vineyard. They nest high in dead trees, but in recent years have adapted to make nests on the tops of poles that have been put up across the Island. There are over 130 osprey poles across the Island, thanks to a project started by Mr. Ben David in the early 1970s. The project has directly helped to bring about a comeback of the osprey whose numbers had dwindled dramatically as increased development claimed large swaths of forestland and its dead trees. As a result osprey began to nest on utility poles. Last Thursday’s accident was a case in point. Mr. Ben David said he was aware that an osprey nest had been built on a tall utility pole on Chappaquiddick on property owned by Allen Slater. A plan was in place to put up a pole for the osprey after the nesting season this year. “We had a 40-foot pole on the ground ready to be installed. We were just waiting for the birds to vacate the nest at the end of the breeding season,” Mr. Ben David said. Mr. Ben David said after talking to the electrical crew, it is believed that a branch crossed the wires high in the pole and started the fire. “It was not a lightning strike,” he said, as some had thought. Once the osprey chicks came to him, Mr. Ben David said there was an urgent need to find fresh fish to feed them. His brother, Jules Ben David, gave him a striped bass fillet from a fish he had caught the day before. On Friday morning, using an extended pair of pliers, he began feeding the animals. Taking a small piece of fresh fish and touching it on the bird’s beak, Mr. Ben David began whistling in a manner that sounded like an osprey. At first the birds were reticent. But in a short time, they came around to his way of thinking and started eating. Mr. Ben David also got in touch with his friend Cooper A. Gilkes 3rd, who owns Coop’s Bait and Tackle in Edgartown to put the word out: fresh fish wanted for baby ospreys. Soon Mr. Ben David had mackerel, striped bass and bluefish for the birds. “They eat a lot,” he said. Mr. Ben David makes it a practice not to humanize animals, especially ones that are only passing through his care and back into the wild. But on Friday morning, he did refer to his special guests as the Three Musketeers. Reached yesterday, Mr. Ben David said the juveniles have grown rapidly over the weekend and are now feeding themselves, no nudging needed. The change in just a few days is dramatic, he said. Meanwhile, over at the tackle shop they’ve got something to talk about besides who caught the big one last night.